642 pages | 217 B/W Illus. 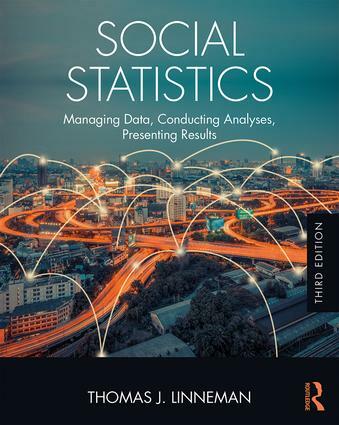 With a clear and engaging writing style and strong examples from the real world, this text covers current statistical techniques at an introductory level and emphasizes the clear presentation of results to a variety of audiences, making the course more useful to students and their careers. Interconnection features among chapters help students understand how all of the techniques fit together. Using varied data sets, the text features a highly rated companion website that includes videos of the author offering step-by-step explanations of how to carry out the techniques, interpret the results, and present them to varied audiences. More inter-chapter connections have been added to improve students’ conceptual learning. Several examples (on immigration, health, and civil rights) now permeate the text for easy comparison of techniques across chapters. The section on managing data is considerably expanded to cover topics such as finding new sources of data, dealing with missing data, and how to combine data reliably. Very current examples from the scholarly literature from criminology, education, and health show how researchers use each chapter’s techniques to tell compelling stories. Instructors can choose from a variety of greatly expanded materials to enhance their lectures: engaging animations of key concepts; dynamic demonstrations of how statistics change in line with the data; short lectures on difficult-to-explain topics; and in-class exercises that will help students learn how to make sense of statistical results. Thomas J. Linneman is Professor of Sociology at the College of William and Mary in Williamsburg, Virginia, where he has won several teaching awards for his rigorous and innovative courses.